Perception is a prejudicial, prolific, paper tiger of piteous proportion. channelled message from Oliver received on 8/10/17 at 11:29 a.m. ET US. Meet Miles. He was the love of my life. His story is brimmed and worn like one’s favorite straw hat on a steamy summer’s day. Suffice to say he lived hard and died harder. I had been in Tucson, AZ about a month when he passed at the human age of 19. This was my second, 6 month season house sitting for the same couple, an adorable pair, happily married for 27 years. Before I decided to accept their kind offer, I laid with Miles for quite some time talking with him about my options, seeking his approval. I knew the chances of his being with us when I returned were slim, and I didn’t want to travel so far away if it meant leaving him for the last time. I felt if I left he would, too. And, he did. It was just after midnight in late June, 2016. I’d been on the phone with Miles off and on for hours, my son hooking me up for the first time using FaceTime so Miles could see me. Having just clicked off minutes prior, I was in the swimming pool, heated from the intense southern temperatures during the daylight hours, neck up in water, floating in the shallow end. Looking up into the sky a star shot across the darkness, traveling slowly across the wide-scape. Then the moonlight intensified to a spotlight pitch. And I knew. The next morning I got a quick text from my son confirming Mile’s departure and the time as being when I was in the pool. I used the photo above because it came to mind as I wrote down Oliver’s channeled message above. In the photo, Miles is the paper tiger, a person or thing that appears threatening but is ineffectual. 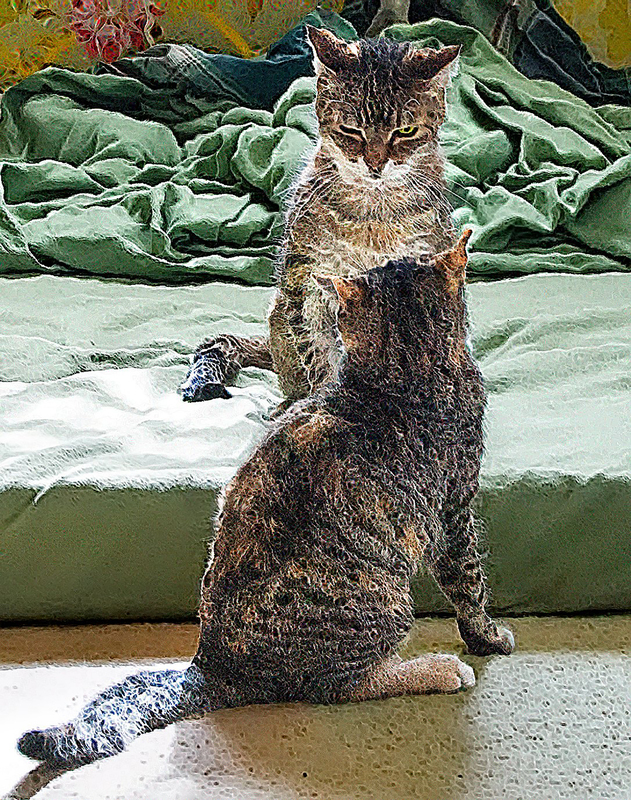 Pictured here at 18 years, tired, proud, Miles is willing to stand up to any challenge, which, herein, is dealing with the energy of a months old kitten, Spirit. As you can see, Miles won simply by stature – a facade of power and prowess, effective in ability to intimidate the youngin. That’s the message of the paper tiger… one of strength, intimidation, positioning. That’s it. You are either feared into submission, or you are not. The paper tiger remains the same, a perceived force without a spit of air; hot or otherwise. So how does that relate to consciousness and the process of creation? I’ll leave the personal interpretations to you; however, it is my feeling that our skewed perception of reality is based partially on the successful efforts of this realm’s paper tiger archetypes. We are energy. We are ever present consciousness. We exist here by choice and have complete power over our experience. It is those elements of fear that present to prescribe how we perceive that have determined our narrowing, ego-based, molecularly founded, emotionally grounded, materially challenged experience. It is such perceptions shared, indoctrinated, enforced that enable and effectuate the continuation of 3D as a fixed state, when, in fact, it is as malleable as a marshmallow over the campfire merging with chocolate and gram to become something more…S’mores. Thus, the channelled message is one of empowerment. Sense! See! Be all you were born to be. Achieve, fear-free of the flees of status perceived. Of the new, conceive. Then, believe… and you will succeed! Random thoughts continue today. I’ve had so many shares of information in the last couple of days and no real way to offer, as the volume makes it too consuming for me to write a diatribe about each one. Therefore, to follow you will find three of the more forward pressing pieces. Virtual Reality – What is real? The image of me or the wall beyond the train window? Karma doesn’t know the difference between 3D reality, parallel timelines, or virtual reality for that matter. Karma is a type of seeking energy source, magnetized to individuals and situations wherever, energetically they exist. And how can we tell what reality we are in? Good question. I am not sure we can. Not completely. We can feel our way in, around, and through, and for those of us with sensitive tentacles we may be able to light the way for ourselves, at times, but perception and frequency of consciousness play important roles in the process. Look at the photo to the left. Which is real? 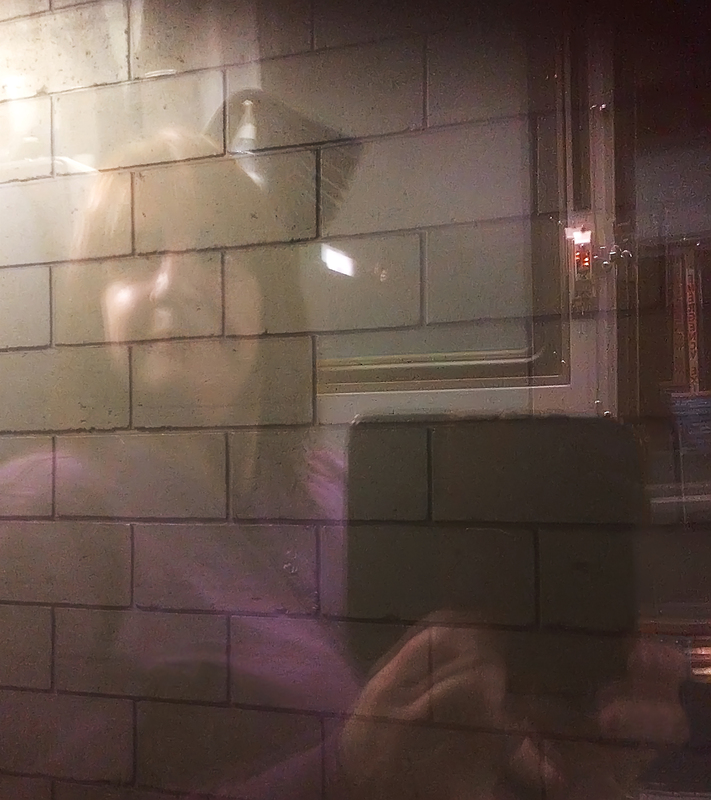 Am I the real one sitting in the train car, or is it the faux brick wall? What would your answer be if the photo was the same but the focus was switched? 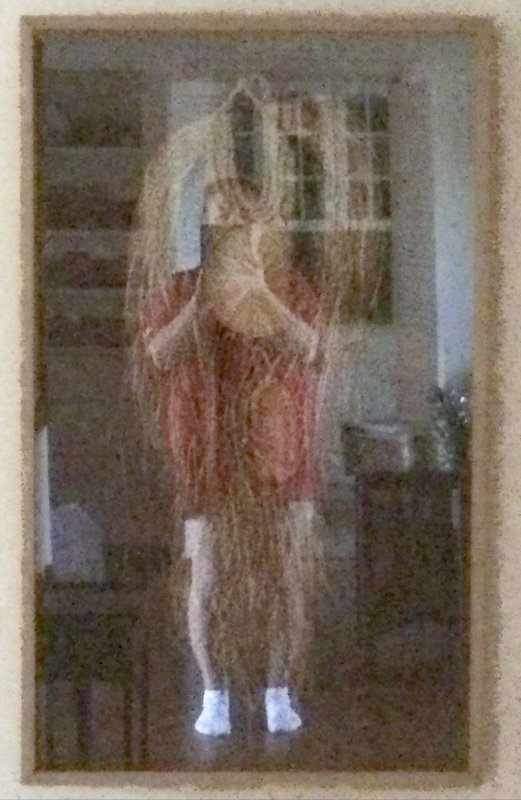 What about the fact that this is a photograph, snapped as they are, in mirrored reflection? What does that make THE reflection in the photo? A reflection of a reflection? A convergence of elements into a perception correction by means of reversing the reversed image so as to rearrange it into a pixillated labyrinth of accuracy? All are true and all are untrue at the same time. What makes one real is what you think. Clear conceptualization shimmering with possibility. Ready yourself for the self-revealing retrograde. Mercury will move into full retrograde tomorrow, Saturday, the 12th of August. The beginning stages have been building to that point of crescendo since July 23rd, with a pre-retrograde intensification just three days ago on Tuesday the 8th. That’s what I’ve been feeling, this revv up since Tuesday. The energy is nearly palpable, with significant increases in my intuitive and psychic abilities. Get comfortable. Things are about to get colorfully real. Get ready. What do I mean by that? The retrograde effects many people, whether they be like me, sensitive to the energies, or those engaging those like me who are sensitive. This retrograde is all about new beginnings. So many are finding changes happening to them in their world, not of their own doing, yet present. Persistent. That’s the karma of the present day pushing past the old paradigm of thinking into the new. With that comes change. That change is offered to each of us by means of our own hand. However, if we don’t see, or know to take heed to the odd expressions in our experience then sit back and wait, it’s coming, and with it magnanimous change. Karmic change in all realities. So what might that mean to you? You have the power and the backing of the Universe at this time of new beginnings to manage and control the outcome of your future. Now is a choice point, be it yours or Source’s. Now that you know, you have no excuse to simply yoga your way to a youthful new now. You need to take action. In other words, grab a moment, look without and see what seems to be organically resonating out of your tomorrow, then look within and see how you feel about that and what you desire. Stay? Leave? Alter? Remain the same? Done? Great. Now, let go. This is a time of wishes coming true, and one of communication. So, if you would like to talk with your decease loved, or not so loved ones… if you want to connect with Source, other etherial or terrestrial beings, those from the past… the future, or if you just want to try hooking up with soul consciousness (higher self), now is the time (see retrograde calendar above). Get comfortable. Get ready. It’s coming. Here’s to your receiving all you seek! Inserting the “really” into what is really going on. What if the real purpose of one thing was actually something completely different, and you just couldn’t tell. What if that was the intention? What if you are so intrenched in your grounded life that you can’t perceive the successful indoctrination, and clandestine continuation to skew your view? Let me give you an example. What if the real purpose of the 1HP website was to circulate its logo image across the net, infect archive and satellite data with it’s sigil message in an effort to spread the word and land the nebulous of its generation on all servers across the system, assuring delivery via existence thereon, alone, and its energetic influences therefrom? What if all of these articles I’m writing, which are great, aren’t they?, were to grow an audience, then a following, then take over the world and “buzz” on over to infinity… and beyond? Think about it. The more successful this site, the more prevalent the grassroots spread of the message. Of course that isn’t what I’m doing… or is it? lol. Yet, as a sigil, one that appears in the footer of every 1HP page, and one imbued with the 1HP tag line, The Pathway is Open that is exactly what’s happening… right? Placement in cookie and bookmark files, on indexing sites like Google and Yahoo, and the directories of social media platforms, the sigil file thrives as an added benefit to the whole of consciousness by its sheer existence, as a co-conspirator in the crimes of enlightenment and personal truth. What do you really know for sure? Take this example and consider its application in broad corporate and government management, control and creation processes, or directly between energy sources. It is a powerful strategy to integrate ways of thinking into the mass consciousness by subliminal means… have it believed, defended, and so influential that after thousands of years we humans still community under its spell. There we will remain until and unless we break through and burst free of its hold. The first step is allowing for the possibility. The next is becoming aware. After that, all you need to is choose to sense only your truth and there it will be, void of influence. Purely of you. Looks like Oliver took us from prolific paper tigers into the topics of virtual reality, retrograde and karma, as well as being open to ask “What if” as it relates to your perceived reality, and did such so nicely that its blend into a collective pot of possibilities is forever changed. No judgement here. No fixtures. Just a rolling thunder of messages and information as an offering of potentiality for those inclined to know more. THE FAITH (main blog) what's this? Ongoing collection of blog posts published on or after 6/18/18 to the 1HP sites that expand beyond the materialism of the messages manifest by the Oliver collective thus far, and move into the energy of the "to be known" and yet unseen. Collection of 128 blog posts to the 1HP sites from inception on 5/26/17 thru 9/19/17 that comprise the foundation of the messages the Oliver collective wished to release during the initial stage of this project. Oliver’s Afterthoughts was a weekly tarot card pull from the After Tarot deck by Corrine Kenner, posted for the period 8/4/17 thru 10/6/17. All photos and other digital art found on this site are the work product of Ana Komorebi, unless otherwise indicated. 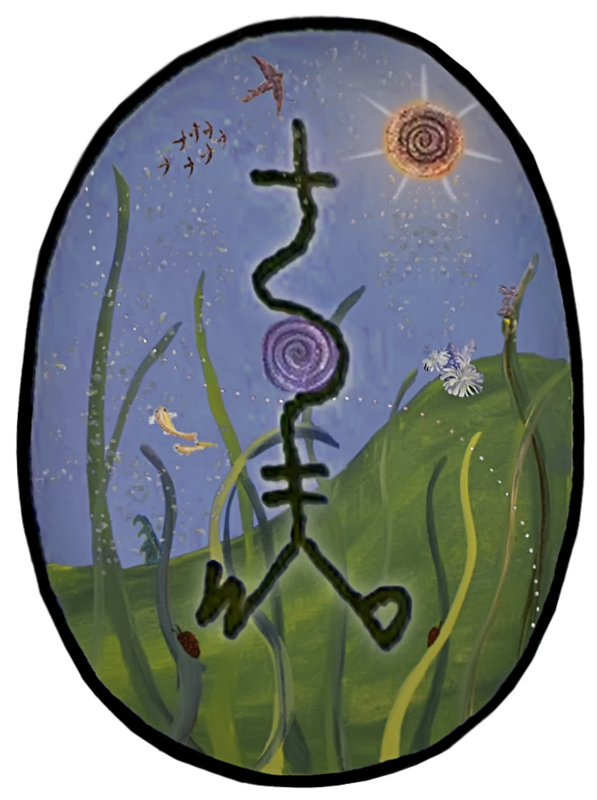 TOHP logo is based upon the original sigil design, and concept of my good friend and closest confidant, JEC, who, in his anonymity continues to gift the world with the waves of change imaginalized from the onward movement of his butterfly wings, cracking through the shell of change and opening a pathway into the new.